constructed from neoprene with hook closure for a snug fit. 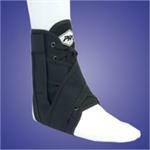 Support straps encircle the ankle in a "figure 8" pattern for secure lateral and medial support. Designed to fit right or left foot. Ideal for soccer, basketball and football skill positions. 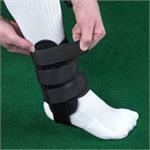 The perfect aid in reducing edema, positioning tens pads or controlling malleolus or peroneal tendon restrictors. Constructed of 1/8” thick neoprene with nylon facing. Addition of a zipper makes application easy. 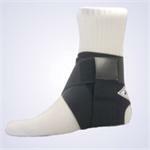 Designed by a Professional Football Athletic Trainer to firmly but comfortably pull the distal fibula and tibia together to reduce stress and support the ligaments of the lower leg.